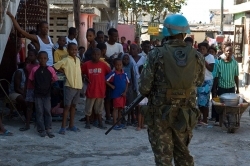 UN occupation troops occupy the Cité de Dieu neighborhood of Port-au-Prince during a mass arrest on February 1st, 2008. A biochemist by training, 58-year-old Patrick Elie is a political activist in Haiti, who has been fighting since the 1980s for the right of all Haitians to shape their country's political future. A member of Jean-Bertrand Aristide's cabinet in exile following the 1991 coup d'état, and Secretary of State for Defence after Aristide's return, Elie recently and reluctantly accepted President René Préval's request to preside a commission studying the question of security in Haiti. In this interview, conducted in Port-au-Prince four years after the 2004 coup d'état against the Aristide regime, Canadian photojournalist Darren Ell asks Elie about the obstacles to Haiti's quest for true sovereignty. What is the connection between Haiti's crumbling infrastructure and recent political history in Haiti? I'm thinking in particular of Haiti's roads, which are so dangerous to navigate. Roads in Haiti are difficult to maintain because of our limited means, but also because of the topography of the country: mountains, running water because of deforestation, and so forth. More importantly, the strength of the mobilization we had when Aristide was elected in 1990 has been broken twice. During Préval's first presidency, there was more interference. We have had no continuity. You don't build infrastructure in two days, not even over one mandate. It requires a national plan that holds over a quarter or half a century. If you get clobbered every time you move forward, then you're constantly wasting money. Nothing ever gets finished. Every progressive government in Haiti since 1990 has found itself in the position of trying to fix a collapsing house, while assassins are trying to break down the back door. People looking at the house later blame the government, but it was busy the whole time keeping the assassins-–you guys!-–from breaking in with your machine guns. People always leave out that part-–the constant aggression, the constant sabotage. You'll hear people say, "Aristide spent 10 years in power and he achieved nothing!" It makes me want to laugh and cry at the same time. After seven months in government he was overthrown by a military coup. He spent three years in exile and they count these years in assessing his performance as president at the time. He gets a second term of five years, cut short by two years, and the three years he had in power were spent managing crises and embargos and destabilization campaigns, but they want to count all of that as if he had the opportunity to change things. This is a perverse assessment of his government. Don't forget, we're dealing with the consequences of two coup d'états, 1991 and 2004, the second one having terrible symbolic value: we were trying to celebrate our bicentennial, but instead we were humiliated and violated. It does terrible things to your spirit. It has created a lot of confusion and despair, which are not assets helpful in building a future. Some people said we were set back two years. I say we were set back 50 years. Now we do have a legitimate president, but the post-coup conditions of Haiti have made him obsessed with stability. He is paying more attention to our adversaries, both local and foreign, trying to neutralize and woo them, rather than taking his mandate from the poor of Haiti who gave it to him. Either the president accomplishes the task given to him by the poor or we're going to hit some rough water again. It's a Catch-22 when you've been made so dependent on the people who threw you down in a hole. You want to fight them, but they're holding the rope you need to get out. Canadians benefit from world-class publicly funded education, health care, transportation and telecommunications. In Haiti, these crucial services are almost completely privatized. Can you put the issue of privatization in perspective? We are probably the most privatized country in the world, but they want to weaken the state even more. People in Canada and the US probably think we have a strong government, a Cuban-style state, and that we need to liberalize our economy. The reality is that 84 per cent of kids go to private schools. This has tremendous and terrible consequences. It's the same for public transportation: it's totally private. Water distribution is privatized. Health care is almost totally private. If you go to the General Hospital, the main public hospital in Port au Prince, you will find it completely surrounded by private clinics and drug stores, all run by the doctors working in the hospital. What interest do they have in providing good health care in the hospital? Security is increasingly privatized. There are 6,000 police officers in Haiti, but 15,000 private security agents. Everything that should be in the hands of the state has been taken away by business interests or by the plague of NGOs. NGOs are being used to slowly remove all the flesh from the state. Unless we react to this invasion, it could be the thing that finally vanquishes us. Look at the matter of Teleco, our once-public telephone company. Any serious government in Haiti should go back and arrest every general director of Teleco. Telecommunication represents a huge market in Haiti. Teleco used to be our only telecom. It was publicly owned, it had a huge head-start and it was the first one to start a wireless service. But it was deliberately ruined and undermined so that Digical and other private firms could come in and rob Haitians of profits that could have been reinvested by the state for their benefit. As it is, it's simply making rich people richer. The idea that the state cannot manage things correctly is pure hogwash. Cuba is an example of a country functioning much better than Haiti and other countries I won't mention. It's nonsense that a state can't run something efficiently. You simply have to extirpate corruption. That is entirely possible to do. Rather than selling state-owned enterprises to private interests and giving control to unelected, unaccountable people--which will not solve the problem of corruption--the answer is to clean up corruption. Because the people financed the creation of these companies, they belong to the people. The people need to be mobilized into this fight by showing them what they are losing because of corruption and by showing them what they lose when these companies are simply given away. Privatization is not the way forward. We've already seen what happened because of the privatization of water resources in Latin America. We've also seen how the USSR has gone from a superpower to a Third World country by giving away what the state owned. What are the challenges facing the agricultural sector of the Haitian economy, the peasantry? There are many important issues facing peasants, and they're important for the whole country. The price of fertilizer is one; the availability of irrigation water is another. If the Artibonite Valley alone could be given what it needs to produce, Haiti could be exporting rice rather than importing 340,000 tons per year. This wouldn't require big changes in our policies. But we would run afoul of the US policy of subsidizing rice from South Carolina and dumping it into Haiti. This all began with Jean-Claude Duvalier, when licences to import rice were given to friends of the president. It hit full-stride under the post-Duvalier dictators, who totally liberated rice imports. Now we only produce 60,000 tons of rice, but we need 400,000 tons. It's destroying the peasants. But there's a lot of money being made on those 340,000 tons and the Americans will react if we try to turn that policy around. It's a conspiracy. Haitian peasants used to have pigs completely adapted to our environment. The US, with the complicity of the Duvaliers, completely wiped out Haitian pigs on the pretence of swine flu, then destroyed Haitian pig production by introducing a species of US pig that eventually died because it couldn't adapt to the environment. Then the peasants were even more vulnerable. The pig was like a "piggy bank" for the Haitian peasant. He had a few mango trees, a couple of avocado trees and a pig. Selling mangos and avocados covered regular expenses, but when it came time to send a child to school or pay for a doctor, he butchered and sold a pig and the money was there. Once the pig was gone, he had nothing left to do but chop down his trees and sell the wood. It was devastating to the peasants. There are policies behind all of these problems. Unfortunately, these policies have found partisans in Haiti. In Canada, everything from speed limits to water quality is carefully regulated by the state in order to protect the public. Talk about the question of regulation in Haiti. There are few regulations here. Those that exist are outdated or not applied. You can do whatever you want in Haiti. Private water companies are not required to test their water. If you want, you can get a building and some tools and start a treated-water vending operation. If you have enough money, you can buy land and turn it into a dump or set up a disco in the middle of a residential area. You can do whatever pleases your fancy unless you step on the toes of somebody powerful. The state doesn't impose rules on schools. There is no regulation regarding the number of students in a class, nothing about student evaluation, teacher qualifications or the curriculum. People send their kids to schools run by a French organization and their exams are graded in France. You can open a two-room building with one teacher and call it a university. Nobody will come and look at what you're doing. You can call anything an "institute." You can put up a sign saying that you are a doctor curing AIDS and no one will ask you any questions. That is the situation. That is why we need to strengthen the Haitian state, not weaken it. If 50 per cent of Haiti's federal budget comes from foreign aid and 85 per cent of its services are provided by foreign charities and NGOs, is Haiti really a sovereign nation? The sovereignty that Haiti won with so much blood, courage and daring in 1804 was lost when Haiti agreed to reimburse France for property lost during the revolution. Even though we had the appearance of sovereignty, Haitian peasants were breaking their backs to make the French bourgeoisie rich. It became more blatant when the US invaded Haiti in 1915, making sure to leave behind an occupation army in its place. Things since have gone from bad to worse. Haitians are very jealous of their sovereignty, but they're not always realistic about what constitutes sovereignty. We're not sovereign by any stretch of the imagination and if we don't react intelligently with a strategy in mind, we will lose every last piece of our sovereignty. It is only getting worse every day with the NGOs being given more and more power, with the UN military occupation and with a foreign administrative occupation trying to dictate the politics in Haiti. I believe we can win the battle because the odds we face are no worse than what Haitians faced in 1791 when they went beyond freedom to sovereignty. It's a formidable, but not an impossible challenge. To what extent do you blame foreign interference for the problems Haitians face today? Foreign interference in Haitian affairs dates to the birth of Haiti. There has always been a strong will to make Haiti fail. I'm not saying Haitians weren't partly responsible. But if I have to point a finger at Haitians, I'll point the same finger as Frederick Douglas did in 1893 when he said that the curse of Haiti was not the ignorant masses, but the educated and wealthy minority. They're the ones who destroyed the country through greed, believing themselves to be a European tribe in this land, different from the poor peasant masses they exploited so blatantly, then by getting in cahoots with the enemies of Haiti. Foreign powers have played a great role in putting us in that situation, but they're not alone. They have their accomplices here. Take very recent history. I don't believe the US, Canada and France would have had the pretence to intervene had the Group of 184 and others not opened the door for them, had they not pleaded for an intervention and made it palatable for the average Canadian or American to think that it was their right to intervene, that it was their "responsibility to protect." I'm confident that 95 per cent of Canadians believe that Canada came here to protect Haiti, but none of them have asked themselves why Canadians and French and Americans weren't protecting Kenya or Chad or any other dozen countries in the world that had a worse situation in 2004. Rather than help us toward a negotiated settlement-–Aristide had bent over backwards to obtain this-–why did they send their paratroopers and marines? We have to constantly raise this question. Aristide was kidnapped and dumped in the Central African Republic, a country in a state of permanent war, but I don't see any expeditionary force going there to re-establish peace, kidnap a president and so forth. Sri Lanka, which has a full-scale civil war in its midst, is sending soldiers to teach us about peace. Guatemalans are teaching us about democracy and human rights. It's so obvious to me that you've been lied to, but you've grown accustomed to those lies. The Haitian army has always been a tool of internal repression in Haiti. You are overseeing a commission studying the question of security in Haiti. What is being said about this issue? First of all, the army was never a real army and it was certainly never Haitian. In 1915, US marines invaded Haiti and imposed US rule on Haiti. Early on, during the occupation, after disbanding the army that was there, they created a core of locals to help them fight the Haitian patriots, the peasant resistance. That's the birth of the monster. It was created as a monster, as a group of armed locals working under direct orders from US officers to kill Haitians opposed to the pacification of the population. When the marines left, they left the monster with us, with the same mission: to repress its own people and occupy the country. After that, Haitian dictators used the army to protect their own power. It remained a tool of internal repression and as a tool for use by the foreign powers that created it. It happened all over Latin America. It's a recipe that's been applied everywhere the US or any other colonial power has left their mark. Today, the Haitian state is unable to guarantee the security of its borders-–land, sea or air-–and it has to be able to do that. It will need some force to do that, but the idea of such a force conforming to the model that we had is intolerable. We have a chance for the first time in decades to define our own national security strategy and philosophy. I've accepted to head the commission looking at this problem, but it isn't going to be easy. Forces within this country will oppose the vision of a security force whose mandate is to protect the country and the nation rather than to crush the people's will. Of course, opportunistic foreign powers will resent this vision as well because a new army should not only protect the land, but also the political regime that the people have chosen. This is also the role of national security forces. They have to protect what the people choose. Already there are major efforts to turn the Haitian National Police into what the army was, a tool of repression and a referee of political life, something to be used to put pressure on certain politicians or to overthrow others. What do you see as key solutions in Haiti's ongoing struggle? You build a country from the bottom up. In Haiti, that means the peasants, the Haitian countryside. Once that is the priority, the rest will follow. With cheaper fertilizers, better irrigation and modern tools instead of hand-held hoes, production would increase. The exodus to the slums would slow down. That's the way to go. Building electric plants for 24-hour electricity should not be a priority now. Port-au-Prince is sucking the country of its people. It started with the US occupation. The Americans centralized the administration of the country. Port-au-Prince became the centre. Prior to that, there were only regions. The US closed all the ports in other regions. Everyone started going to Port-au-Prince for opportunities even though there were none. This country has been living on the backs of Haitian peasants since the era of slavery. The wealth of the country has always come from the countryside, but we've never sent anything back to the peasants. This is one way to reclaim our sovereignty, by regaining control of our stomachs. It will build national cohesion. What message would you like to pass on to Canadian and American readers? In your view, what should they be thinking about if they want to help Haiti? Become citizens in your own countries. You're nothing but consumers. You've lost control of your governments. Open up your eyes and ears to the lies you're being fed about other countries. Also, Canada should stop robbing, literally looting Haiti of its better minds that are so needed here, especially in the last five or 10 years. I've heard French President Nicolas Sarkozy speak about "chosen immigration,” but Canada has been doing it for years. I think the reason Canada is "involved" in Haiti is because it gets finished products without having invested in them; that is, Haitian minds: technicians, doctors and engineers. If you do the math, you'll see that Haiti has helped Canada much more than Canada has helped Haiti. It costs money to raise a kid, send him to school, then have someone grab that finished product for free and start using it. Please tell the Canadian government to stop baiting our kids. And stop destabilizing our country because it just makes it easier to entice and extract our most talented people. Darren Ell is a photographer, independent journalist and MFA student at Concordia University. He has been working in Haiti since 2006.